Weight management can guard against joint problems. Pomeranians are generally a pretty tough breed, but that doesn't mean they aren't prone to common disorders that can show up as body stiffness. Any kind of change in your pom's body posture should be taken to your vet -- fast action can help keep your pup healthy and pain-free. Stiffness in a pom isn't something you can ignore -- it can be a sign of infection or paralysis. This can happen if your pom has a herniated disk or something called chondroid metaplasia -- disk calcification that develops with age. These conditions can present with stiffness in the hind limbs or all limbs, depending on where the injury is located. Weight management can help alleviate the potential for this kind of disorder, as a tubby pom is more prone to disk problems than a fit one. If you notice stiffness, a trip to the vet can help ease pain and limit damage. Poms, like a lot of toy breeds, can live well into their teens, and with age comes the potential for osteo-arthritis and other age-related musculoskeletal disorders that can make them stiff, cranky and uncomfortable. Stiffness in a pom, especially after getting up from a down position or waking up from a nap, could be a signal of arthritis. Your vet may recommend joint lubricating supplements, anti-inflammatory meds or some good old fashioned exercise or physical therapy to make him more comfy. Your pom may be stiff because he's been hurt. 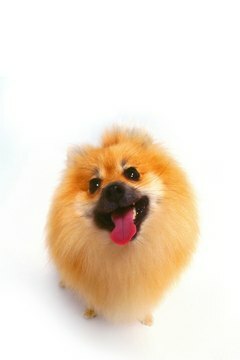 Tiny creatures, poms can injure themselves jumping from even seemingly low heights, like from a couch, bed or low porch. Because of their fluffy nature, it can be hard to see a pom’s twisted or injured back or leg right away -- your first clue may be signs of stiffness. Fast medical attention can keep the delicate bones of your pom from healing wrong. Toy breeds, like poms, are more likely to suffer stroke and neurological disorders than their bigger breed buddies. If it seems your pom is drunkenly weaving, walking in circles or losing balance, it could be sign of stroke. Any sudden change in physical posturing should be checked out by a vet right away -- the sooner you get help, the better you pom's chances for recovery. Just like people, poms can sometimes feel changing weather conditions "in their bones" and stiffen up in damp or cold conditions. If you have an older pom who has a healthy vet check-up and still has occasional stiffness, give him a warm, comfy bed, especially in colder seasons, and let outdoor pups come inside when the weather is extra harsh. What Can a Cat Sonogram Find?